Our individual journey towards a joyful and balanced life begins when we are little babies. We are conditioned by our upbringing, culture, schooling, etc… Today, I share my personal journey with you, in hopes that it will inspire you to take a chance and dare to be the real YOU. When I was a little girl, I always felt as if I was out of place. Few of those around me really understood me. Let’s just say that there was no real bonding ever established, especially with my siblings. I really believed that I was adopted! At school, I was known as the smart girl from Panama. I was chubby. I was talkative. I didn’t play sports. I was always messy. I was never the most popular kid in grade school. I was, however, always known to be a good friend, and I’ve maintained many close friendships from elementary school to this day. Fast forward to High School. I was involved in orchestra. I was an excellent student who maintained great relationships with teachers and administrators. I had a few close friends, but never really clicked with a particular crowd. I was friendly with kids from a variety of groups, across the racial & cultural divide that so often marked the late 70’s in Texas. Little did I know that my “I” was in hiding every day a bit more. You see, I lived in a very sheltered environment, so “experiencing” new things was not really encouraged. It was as if I had two separate lives: school and home. My school life was controlled: do your work, stay out of trouble, be home when school lets out. Period. My home life was more complex. It was at home that the most complex lessons of who I am began to emerge. These lessons laid the foundation for decisions which I made throughout my life, many of which brought me great sadness and pain, and many of which resulted in the most amazing joy imaginable (my boys). In many cases, those feelings were intermingled in a bittersweet manner. I’ll give you the quick version. Get your degree (a.k.a. don’t study what you love because that will never pay the bills. Study something profitable so you can support your family). Take time and enjoy childhood. One never gets a second chance to be a kid. Fall in love. Take a chance. You may have a broken heart before it’s all over with, but you learn the intricacies of relationships and the sensitivities that are required to maintain a happy relationship. It is within relationships that one learns the most about one’s self. Take your time to mature and grow before marriage – I got married at 19. Really. Why, you ask? My answer would be that my cultural imprint had a huge impact on this decision. Low self-esteem had a huge effect as well. Learn a trade that is interesting, challenging, and rewarding to you. – Working at something one is not passionate about increases the risk of rapid burnout in the ‘profession.’ The stresses &/or boredom associated with such work WILL affect everything in one’s life, including health, relationships, and finances. Really. Work is a reality of life. 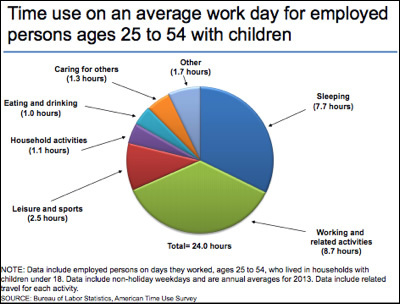 Americans spend a HUGE amount of time at work. The chart below is an AVERAGE work day for employed persons. As an employed single mom, with three boys, I guarantee that the average data does not apply. Enough said. When there’s a feeling of angst within us, when we feel anxiety, boredom, discomfort, or dis-ease (a.k.a. disease), it’s a sign from our soul that we are not in alignment with our soul’s true path. According to my teacher and mentor, Dr. Bruce Berkowsky, the path to healing is to allow ourselves to again become aligned with who we really are (at the soul level). I believe that the journey feeds on itself. We cannot find inner peace and contentment when our bodies are ill. Our bodies don’t heal when our mind and spirit are troubled. So how does one start? It’s a combination of fundamental elements! It’s a mind blowing realization!!!!! I cannot tell you what will work for you. I can share with you what has or has not worked for me. I can tell you, however, that wherever you begin, the other elements will follow. I once was in a very dark place. Yes, I was. I struggled every day to have the energy that I needed to support my kids and myself. I was a single mom and I held many fears. Unbeknownst to me, I also held much deep seated anger within myself. Along comes a friend who invites me on a trip to the mountains. I did something that was totally uncharacteristic of me. I said YES!!! That was my first step. I didn’t overanalyze it. I didn’t question it. This trip changed my life. I opened my heart to a new perspective. It was during this trip that I found my “I” , by realizing how every action that I had taken to that moment resulted in everything that I had become. I realized that all the seemingly “separate” interests that I had (herbs, essential oils, reflexology, Kabbalah, crystals, health & healing, sacred geometry) were all interconnected and very much a part of my “I”. Unbeknownst to me, I had been gathering pearls of wisdom towards this journey all along! The challenge I faced was how to make seemingly insurmountable changes in my life that would take me from the darkness of my “reality” to a place of light & joy. I started to verbalize my truth. Softly at first. Now it’s closer to a roar! I walked away from those that were unhealthy for me. I walked away from a job that demanded of me certain things that I felt were incompatible with my work ethic. I moved away from a toxic environment. 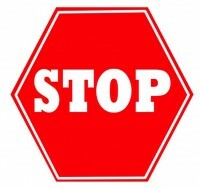 I began to make lifestyle changes that were conducive to better health. Slowly. One step at a time. Those around me started to notice the changes within me. Those that were uncomfortable with such changes walked away. Those that know ME and love ME are still in my life. The moment I connected with the truth of who I really am, (as a walk-in, unregistered attendee at a Spiritual PhytoEssencing workshop in LaConner, Washington), there has been no turning back. I’m grateful for every note & comment I receive from friends and acquaintances that have begun their own individual journey to health as a result of something I said, presented, discussed, or published. I now found myself surrounded with people that are like-minded. I am grateful. I am grateful for every experience, both good and bad, that has shaped me. I am grateful for every breath that I take. I am grateful for those who came before me, for it is because of their actions that I am ￼even here. I am grateful for my parents for giving me life and for doing the best they could for me, as they experienced their journey. We all have baggage. We all have a history. It’s what you do now that matters. What are your thoughts? What are your dreams? What are your goals? See yourself living YOUR ultimate dream. Write down your goals. At every decision point, ask yourself which decision will bring you closer to achieving your goals. Then, I challenge you to act upon those desires. 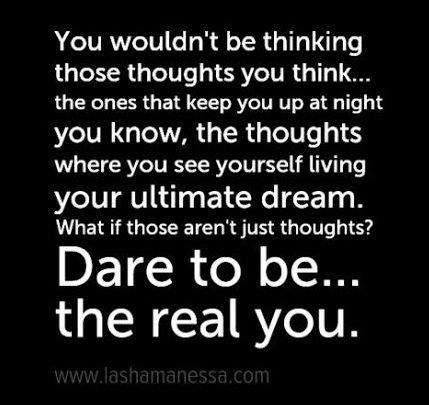 Dare to be the real you.